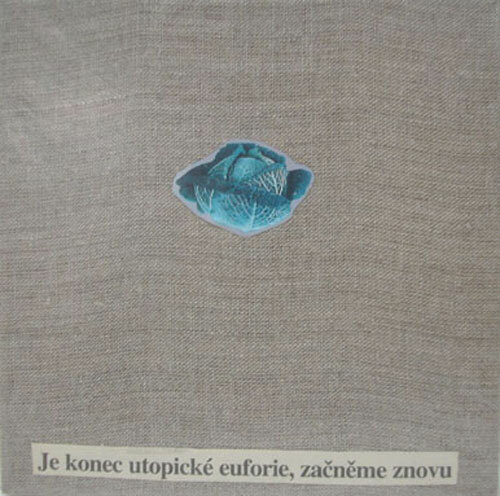 This group show is inspired by a Jiri Kovanda’s citation used in one of his collages named The end of utopia. This injonction could sound like a statement, one of some kind of disillusion. The end of utopias. The causes remain unknown, but it anounces a breaking point. We are forced to a new beginning. Blank screen at the end of an apocalyptic movie. What we’ve known is not any more, let’s start over again. All the pieces shown in the exhibition share this double ambiguity: Announcing a possible failure or the end of an era, they nevertheless create a new field of possibilities. By showing a static time, like snapshots of tension scenes, the pieces create an odd and not lineral temporality, superimposing contingent futures and myth of the origins. The artists present in the exhibition are indeed not that much interested in the end of a story but instead in the fantasy of the rewriting, of the resumption allowed, of the projection towards something else. Once the limits are set, everything is made possible.